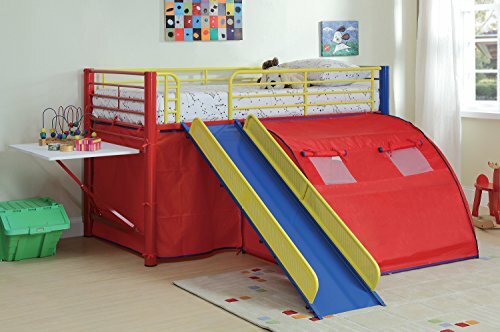 Oates collection youth fun colorful loft bed with slide & tent for boy description this fun loft bed will be a welcome addition to your child's bedroom. Create a cool fort for your little one with this lofted twin size bed. The simple tubular metal frame offers sturdy support, with safety side guard on all sides. An attached ladder makes it easy to climb to the top, while a slide offers a great way to get back down! A tent covers the opening below the bed, for a fun spot to play with toys, read a book, or play hide and seek. Available in a bold multicolor or black with camouflage, this cool tented bunk bed will quickly become a favorite in any child's home. Round tube legs, clean lines, simple shapes. Tubular metal frames. If you have any questions about this product by 1PerfectChoice, contact us by completing and submitting the form below. If you are looking for a specif part number, please include it with your message.